The Executive Board is the steering Committee of the 9th Age project. It is responsible for the overall project management. Supports the Executive Board with staffing and to keep in touch with the existing staff. The Advisory Board consults the Executive Board, but does not have direct voting rights in its decisions. The rules team is the central unifying pillar of game design behind the 9th Age. They chart, guide and oversee the creation and evolution of the game. Under their sole jurisdiction falls the creation of the Main Rulebook and the Magic Paths Book. Their duties include creating rules and regulations under which other teams involved in the rules side of the document creation process will be bound to operate. In addition they will arbitrate should an issue arise during the design process which cannot be solved withing the Design or Balancing Teams, or between the two mentioned teams. Finally they will provide a stamp of approval to the finished product before passing it to the publishing teams for visual creation and ultimately to the Executive Board for the release. The Administrator is responsible for the technical infrastructure of the 9th Age website. The Administrator works under the guidelines and supervision of the Executive Board. The Moderator is responsible for the public forum, moderating its public discussions and handles housekeeping jobs of the forum. The Moderator works under the guidelines and supervision of the Head Moderator. This is a language compatibility team supervised by the rules team. Members would be selected on their skill with the English language (other languages will come into play in the future and will be set up under the same premise as the English language team) and their ability to recognize and streamline the wording of the rules. Their work will focus so that all the rules in all of the 9th Age publications follow the same wording. The number of members will vary on the volume of work and availability of quality candidates. The army design team (ADT) is meant to be the creative spark of the project working withing the guidelines of the rules team and inspired by the background team and art team. The size of the team should not be below 13 (including the Team Leader, but excluding any Apprentice) at any time, nor do we anticipate it will be larger than 24 (including any Apprentice). The internal structure of the team should not be fixed but fluid to suit the needs of the project at any given time, though operationally clear distinctions should remain based on what is worked on at any given time. The ADT will provide no costing of the designs that they implement. Individual tasks will have an Task Group Leader that will have the ultimate decision on design decisions, however, the Task Group Leader should carefully listen to and implement decisions recommended by the majority of the ADT members on an individual task. If a majority of the ADT on the individual task feel that a decision the Task Group Leader is making is improper or incorrect, the majority can ask the RT to take up a decision on the issue. For each task ADT performs (e.g., each army book to be worked on in the current cycle) a task group will be formed and will comprise of a Task Group Leader and at minimum 2 and at maximum 4 other ADT members, the number of Apprentices assigned to task groups will vary from 0 to 2. The various task groups are NOT static and may change from phase to phase in both size and composition. Task group members may step down, or be removed from phase to phase and new task group members may be added as necessary. The staffing of the various task groups is a decision for the Executive Board (ExB), however, these decisions will be taken under advice and recommendation by the RT. 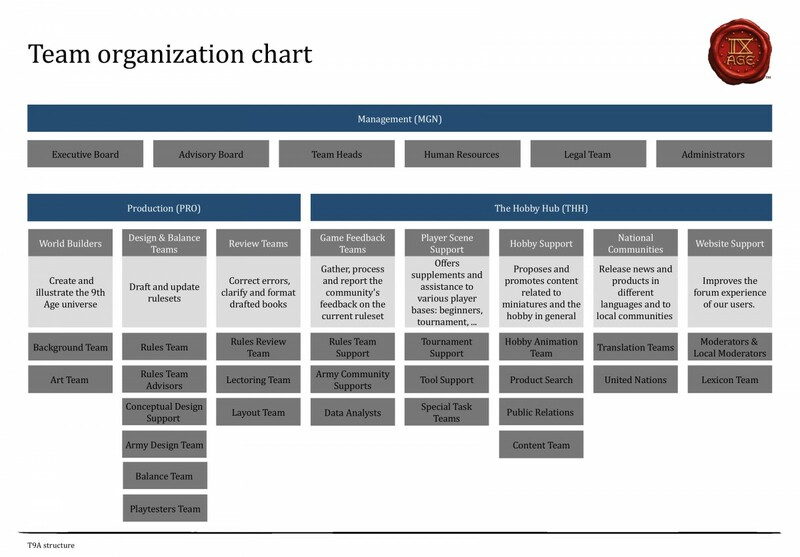 The number of task groups at any given time is determined by the ExB under advice and recommendation by the RT and will vary based on the needs of the project. The Background team creates the background for the 9th Age and is responsible for the stories presented as part of the full army book releases. The focus of this team is making the 9th Age project known beyond the existing community but also to interact with the community at large. A second task of that team is to plan and execute specific Public Relations campaigns, related to a specific T9A event. Assigned to help communities of fans of individual factions by answering rules questions related to the army in question as well as providing answers to background questions once these backgrounds get developed and published. In many ways they are to be the ambassadors of the project among the army communities, including with interactions in their faction’s main dedicated website. A second job the ACS perform is to listen to their respective communities about their wishes and suggestions and pass them on to the Army Design Team prior to the ADT working on their given army. While ACS do gather information from the community relating to rules topics, and interact with the CDS relating to the information gathered and passed on, the ACS do not actively participate with the ADT in generating and writing the rules. ACS is to foster a friendly and productive environment within sub-forums dedicated to the army they support, however, ACS do not act as moderators in their respective forums. All armies should have at least one ACS. The Art team creates the artwork for the 9th Age and is responsible for the artwork presented as part of the full army book releases. Supports the 9th Age project by helping out with layout of books and publications. Supports the 9th Age project with legal advice. Supports the 9th Age project by helping out with grammar and spelling corrections for books and publications. Supports the 9th Age project by play testing and reporting on games. The Tournament Analysis is responsible for retrieving and analysing data from 9th Age tournaments. The Local Moderator is responsible for a part of the public forum, moderating its public discussions and handles housekeeping jobs of a part of the forum. The Local Moderator works under the guidelines and supervision of the Head Moderator. Supports the 9th Age project by translating the publications into other languages. Supports the 9th Age project by publishing content on the website internal Blog. Members are encouraged to be part of the HAT. Helps the 9th Age project with number crunching. In addition, in charge of developing an Elo system for T9A, and promoting it with tourney orgas. They animate the non-English part of the forums. In many ways they are to be the ambassadors of the project among their linguistic community, including with interactions in the main Hobby website in their language. Assigned to help their linguistic community by acting as translators for all kind of questions: rules, background… They organize their forum, adding sub-forums as fit, and animate it. They listen to their respective communities about their particular linguistic needs; they stay alert to detect exceptional suggestions (rules, stories…) and summarize them on to the adequate team. Their job description necessitates fostering a friendly and productive environment within sub-forums dedicated to the community they support. However, they avoid acting as moderators in their respective forums – they would better report to an actual moderator for the “sticky” chore. Supports the 9th Age project by updating Armybuilder/Battlescribe files and our developing software. Supports the 9th Age project by working on the website internal Wiki. They maintain the Rules Lexicon, for which they liaise with RTS. They are also in charge of the Background lexicon; for this tasks they liaise with BGS (Background) and ACS (Army). Finally, they maintain the miniature wiki, with the help of PST (Miniatures). Manages the T9A website, through design or technical tasks. The Product Search Team looks out for miniatures, but also for all kind of commercial product fitting to the 9th Age.